A woman was accidentally shot by an off-duty Massachusetts State Police trooper in a recent hunting accident in Norton, according to Mail Online. The husband of the woman who was shot is now asking deer hunters to pay more attention and know their targets before heading out with deadly weapons into the wilderness. Our Massachusetts premise liability attorneys understand that hunting is intense, and ask hunters to be safe and cautious out there. The 66-year-old woman was shot in the hip while walking her two dogs. The husband of the victim is not only calling for hunters to be safer in the woods, but he’s also calling for a further probe into the investigation of the incident that left his wife as a hunting target. “My mother was shot. This is not OK,” says the daughter of the victim. After the accident on New Year’s Eve, the woman was sent to the trauma intensive care unit of Rhode Island Hospital and was last reported to have been recovering from a fractured pelvis. The hunter says that he accidentally shot the victim after he mistook her two dogs for deer. The accident happened during the evening hours as he was using a black powder rifle to take down deer. After the shot was fired and the target was struck, the off-duty officer ran to her side and started to administer first-aid tactics to help keep her alive as he called 9-1-1. According to authorities, the off-duty officer is properly licensed and is not currently facing any criminal charges. -Always treat a firearm as if it’s loaded. Make it a habit! -Always point the muzzle in a safe direction. About 70 percent of all hunting accidents are self-inflicted injuries. This means that at the time of the accident, the muzzle was pointed at a person. You always want to point it in a direction so that if it fired off, no one would be injured. -Know your target. You always want to know exactly what you’re shooting at and what’s beyond it. Always positively identify what you’re shooting at before pulling the trigger. Shooting at something you’re unsure of is a gamble. In this Massachusetts hunting accident, the gamble was with a human life. We don’t always hit our target. For this reason, make sure that what is behind and around your target is safe. Never shoot into an area that could harm another person. -Fingers outside the trigger. Keep your finger outside of the guard until you’re ready to fire. Many accidental shootings happen because trigger guards were not properly used. Always protect yourself and the ones around you. Be responsible. 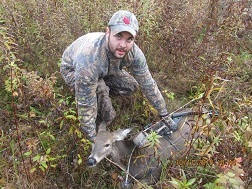 For more information about deer hunting in Massachusetts, visit the Massachusetts Department of Fish and Game. If you or someone you love has been injured in a hunting accident in Massachusetts, contact the accident attorneys at the Law Offices of Jeffrey S. Glassman, LLC for a free no-obligation appointment to discuss your case. You owe it to yourself to be compensated for your injuries so call 1-877-617-5333.